I think this is my first post on this site. I have latly installed Gjaky's mods on my projector and I'm very happy with it. But guess what? Now my moome box is the limit! I have measured the risetime of the Moome's output and it's about 4.8ns what corresponds roughly to 80Mhz bandwitdh. I saw in some other posts that you modified some cheap chinese converters with very good results so why not try to do this on my moome box. 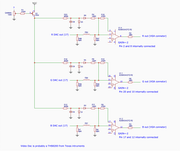 I'm now trying to draw a schematic from the output/filter stage in order to see where i could mod/bypass the filtering. At home I have a 100Mhz scope (would be sufficient for checking output levels) and at work i can check with a 500Mhz scope if needed. Here is a picture of a test pattern at 1080 50p and i think i can do better. i never worked on that model, but i would start looking at the output from the dac, and locate the filters, normaly 3 ferite beads, and then try jump those and repeat the measurement. And after that try look at the output buffer, the dac normaly dont have a problem working without the buffer, but its a bit sensitive to termination. The OLD black is BACK..!! 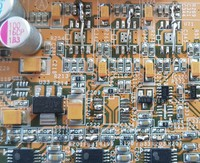 This board uses a combined output amplifier (3 channels in one chip) I guess i cannot bypas that one. 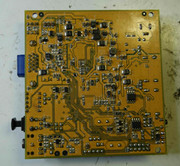 The filtering must be done before the amplifier. sure you can bypass the output buffer, its only there to drive long cables, wich you dont need, so you can just remove it, and jump from the input to the output pin, just be aware that there is a termination out of the dac, and out of the buffer, so u have to remove the termination before the buffer as well, the DAC will most likely work best looking into a 50 ohm load when connected to the projector/ DB boards. Try measure before and after FB8, ill guess the filter eats quite a lot, wich it normaly have to on a standard CRT,as the peaking wil go crazy if you feed it a very high bandwidth signal. You could try just bypass FB8 and see how that look on your tube, you should be able to try a fly wire just after the 58R out of the dac to the connector, to see how the dac behaves directly into the DB board. Gabors boards seems to handle extreme high frequences well,oposit the MP mods that will behave even more odd if they are not filtered. first with FB8 bypassed with a wire result no change at all. Then taking out FB8 and R2 and connecting directly to pin 2 of the VGA connector result no change at all. I guess i need one of those cheap chinese converters in some other thread that can be modified and that do give better results? I also have a HDleeza scaler but because of the HDCP protection the analog output does not work. I'm a little dissapointed after all the effort I did and I really regret buying the external moom card. Perhaps you should try the HD leeza first to see what to expect (1:1 pass-through, converting DVI to analog eg using a laptop as image source) if that turns out to be acceptable, then you can also get a $20 HDMI splitter, which removes HDCP as well. The Cheap chinese HDMI converter can also be an option, albeit being fast after modification it may introduce some distortion to the signal (as I saw on scope), but I think it did not look terribly bad on the Danish CRT meet at Kurt's. The best thing would be to go directly to the int moome card, dont need to be the last one, there is 2 different types on green pcb, one of those is also good, one can not set 0-255 range with a 4:2:2 input, thats a issue, not the dac itself. The chinese dacs are not bad, but also not good, so not realy complimenting the rest of the videochain. I've sent a mail to moome if he still has cards for sale. let's see what comes out. If I now read the specs again of the external box and it can't do more then 60p at 1920x1080 and can only go higher frame rates if you go to interlaced mode. This points again towards the lower spec DAC. Ill think the EXT dac is also pointed to the 7-8" low end projectors, like Barco 808 and alike that did not have internal slot, and there was the int alternatives for NEC Sony and Marquee with better specs in the last generations. About the EXT I don't know because it came out later and it was marketed as an add up of all the specs from the previous models. Anyway I got a mail from moome and he has a new external box with 4 inputs and 14 bit DAC that could be considered ready.. 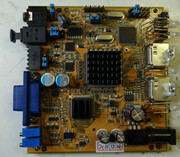 I think that's based on the latest Barco card and it has even BNC connectors. I don't know what it will cost yet. Do you know which older type that I have to look for exactly. maybe I can find one second hand. I switched my resolution to 1080i60 (for some reason the marquee does not show 50i) and then I get horizontally fully resolved with my moome box. but then the vertical resolution is compromised but that could be the the DVI output of my MacBook Pro from 2006. I have a picture from it that I'll upload tonight. this shows clearly that it's the moome that's the limit. The overall picture is actually much better looking with 1080i even when playing a dvd from the Mac I could see improvement. you can see that the projector is running more relaxed. the internal menus also look sharper. 1080i 60Hz needs half the bandwidth of 1080p 60Hz, no surprise at some point the moome ext box will keep up with the signal. As for the vertical resolution and sharpness I’d say that is probably oly because the scanlines of the half images become visible. When I had 8” CRT I used 1080i 96Hz resolution, there the visibility of the scanlines were not a issue, yet the scan and bandwitdh requirements were equal to 1080p 48Hz, and still maintained juder and flicker free picture for BD material.